Wednesday, October 31st, 2018 Posted in Holidays, White Center news | Comments Off on Happy Halloween! Thanks to Gill Loring for one of the area's most abundantly decorated Halloween houses! 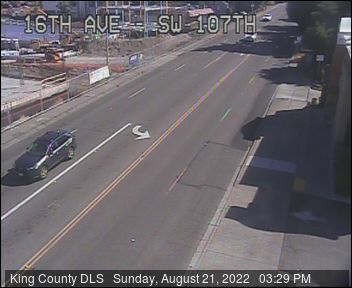 This is on "the west side of 26th Ave. SW just north of SW 104th," Gill tells ... Read more..
Got questions about the Viaduct-to-tunnel transition coming up early next year? That's one of multiple hot topics that the North Highline Unincorporated Area Council will tackle Thursday night. The announcement: North ... Read more..
CRIME WATCH: Seen this stolen car? Monday, October 29th, 2018 Posted in Crime, White Center news | Comments Off on CRIME WATCH: Seen this stolen car? Jill's 2013 black Toyota Highlander with a black cargo box was stolen in White Center on Sunday night, near the roller rink. "It was pretty much out of gas, so ... Read more..
White Center is one of more than two dozen areas of King County where the county will send appraisers for in-person inspections soon. It's part of a periodic process, according ... Read more.. Thanks to Iris for tweeting the photo. What was once the Barrel Tavern is now rubble. We noticed the telltale pre-demolition fence around the site recently; Iris reports that the ... Read more..
(WCN photos) Fighting hunger can be tasty. Last night hundreds of White Center Food Bank supporters gathered at South Seattle College's Brockey Center were reminded of that during the 14th annual ... Read more..
An alert from King County Roads - work starts next Monday (October 22nd) on the "mini-roundabout" planned for 8th SW/SW 108th. They expect to be done by Friday, November 16th. ... Read more..
(Photo courtesy King County Parks) Early reminder so you can be sure this is on your calendar! The Annual King County Parks Family Halloween Carnival is coming up on Saturday, October 27th ... Read more..
Claire e-mailed to say, "We found this pit looking male dog on SW 116th and 12th in White Center/Burien. He has no name tag and he is not chipped." Your ... Read more.. It's a teacher in-service day, so students have the day off in Highline Public Schools and those who follow its calendar. Just to the north in Seattle Public Schools, too. Read more..
Twice a year, you have a chance to make a difference along the Duwamish River and its watershed. Here's the announcement for October 20th's Duwamish Alive! multi-site work party: What is ... Read more..
(White Center Now/West Seattle Blog video) Voting for the general election starts in less than 2 weeks. The most hotly contested race on local ballots is for 34th District State Senator, ... Read more..
Last month, nobody from the City of Seattle was present for the regular monthly meeting of the Community Advisory Committee for its sanctioned encampment near the county/city line, Camp Second ... Read more.. Tomorrow - Saturday, October 6th - brings the first of two White Center Library programs focusing on the history of hip-hop. 2-3 pm, you are invited to hear about "Race, ... Read more..
Metro Route 120 isn't converting to the RapidRide H Line until 2021, but planning continues, and the next stop for your feedback is one week from today: Metro and Seattle will ... Read more.. Announced by King County today: Executive Dow Constantine appointed John Taylor to serve as the first director of the Department of Local Services, which will better coordinate and deliver direct services ... Read more..
(Photo courtesy U-Haul and Northmart) U-Haul sent this announcement that Northmart (9841 15th SW) is now offering its products and services: U-Haul Company of Washington is pleased to announce that Northmart Furniture ... Read more..